In June 1999 I and a hundred or so others (teachers, poets, poet-teachers) gathered at Bard College for a conference on the possible connection between experimental poetry and experimental pedagogy, hosted by Joan Retallack among others. There were six or seven of us from the Kelly Writers House at the conference, and on the last morning of the three-day confab (there on the slopes leading down to the eastern side of the Catskills-region Hudson River, it did at times feel like summer camp), we presented about the Writers House itself as an alternative learning community focused on poetics. Conference done. Then we promised ourselves we’d do some kind of followup in Philadelphia, and indeed did so in early 2001. 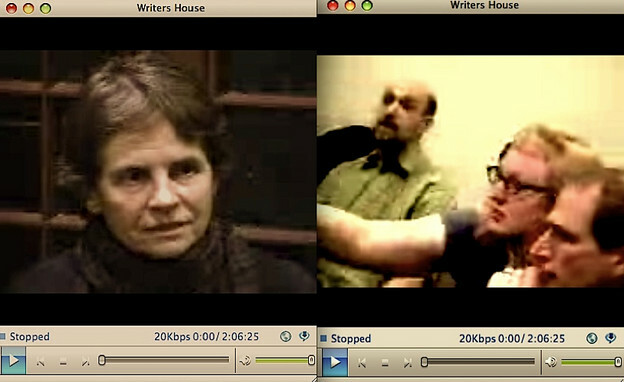 Joan Retallack came down from Bard, reading some of her own poetry that seemed relevant to the theme (alt-poetry, alt-pedagogy), and then Kerry Sherin, KWH’s director at the time, described a transition to the next and longer part of the program: a discussion, as a follow-up to Bard, about specific pedagogical issues and practices. There were about forty of us in the room there at the Writers House, in addition to about thirty who were tuning in by live webcast. Louis Cabri, for instance, was then in Calgary — and participated by posing some questions. Not long ago Jenny Lesser converted the old RealVideo-format recordings into audio-only mp3, which of course these days is a much more usable, portable mode. Here's Kerry Sherin setting up the discussion, by, in part, remembering the Bard conference. Here's 9 minutes or so on experiential learning. Here's a discussion of what makes it difficult to teach experimental writing. And here's a link to the whole 2-hour audio mp3, and, for your video fans and users, still, of the Real player, here's a link to the streaming video.